Nancy Morrison, 85, of Onigaming and Daryl “Hutchy” Redsky Jr., 7, of Shoal Lake 40 stand together at Kenora’s second Energy East pipeline information session. Anishinaabeg and fellow Energy East pipeline resisters made a presence inside and outside Lakeside Inn on Tuesday, Aug. 12 for TransCanada’s second Kenora, Ont., open house. “What do you project for the future? In 50 years, 25 years, 100 years, what is going to happen to the pipe? It’s going to corrode…It doesn’t matter what you say, there is going to be leaks in there…. 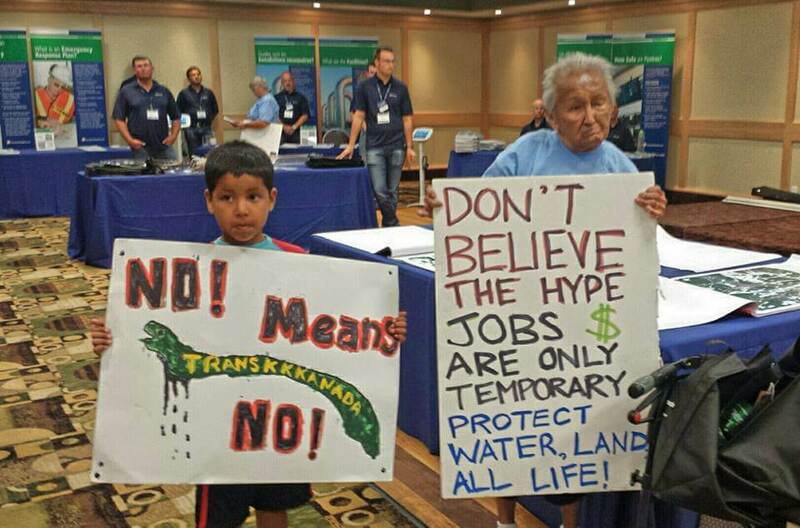 What is going to happen to our water…our children are not going to be able to drink it,” said elder Nancy Morrison, 85, originally from Onigaming, who challenged TransCanada’s “Gary” with the people standing behind her. Seenie, who vocally shut-down Phil Fontaine’s speech at the University of Winnipeg in Janurary, vowed to keep speaking out and put her life on the line in order to stop the project. Fontaine’s consulting group Ishkonigan is contracted by TransCanada to engage with 185 first nations communities along proposed corridor.